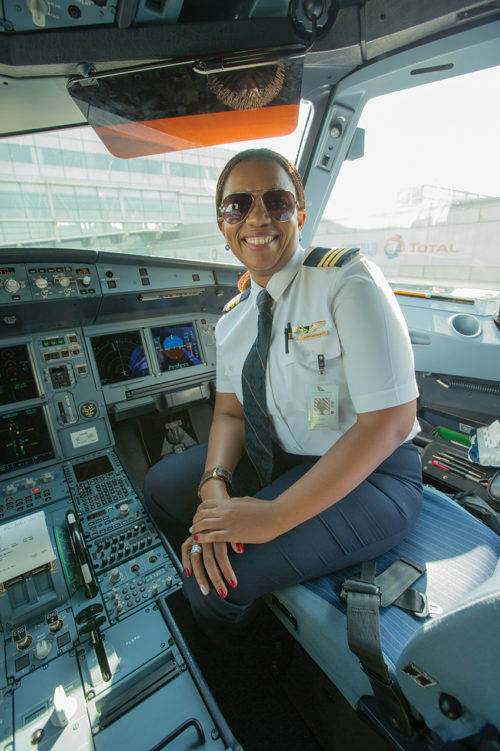 SA’s first black female pilot proves the sky’s the limit. Twenty years ago, Asnath Mahapa had never even set foot in an aeroplane. But she was determined to beat the odds and today, as South Africa’s first black woman commercial pilot, she flies for SAA and has established her own aviation school east of Johannesburg. It hasn’t been easy, but the 36-year-old mother of two hasn’t allowed gender obstacles to stand in the way of achieving her dream. As a pioneering force in the arena of local aviation, she is opening doors for young people – especially women – to fly high and soar above society’s expectations. But Mahapa’s father wasn’t keen for his daughter to dabble in this ‘non-familiar thing’, and so the bright matriculant enrolled at the University of Cape Town to study electrical engineering. But she wasn’t happy. “It just didn’t work for me right from the start,” she confesses. But the national airline turned down her application. Undaunted, she decided to go it alone, determined to become a pilot no matter what it took. So, in 1998 she began training to obtain her PPL (private pilot licence) through a Port Elizabeth flight academy. The following year, after clocking up 200 hours of flying, she secured her commercial pilot licence (CPL). She was just 20 when she qualified, and was still bright-eyed and idealistic. Mahapa ended up joining the South African National Defence Force for two years. But even then she had to fight to get in, because the air force didn’t recognise her qualifications. So the budding aviator had to swallow her pride and start from scratch. “I realised it was the only way,” she says matter-of-factly, without self-pity, “even though I was grounded and couldn’t fly (initially).” Despite having a tough time of it, Mahapa obtained her pilots’ licence (again) through the air force. 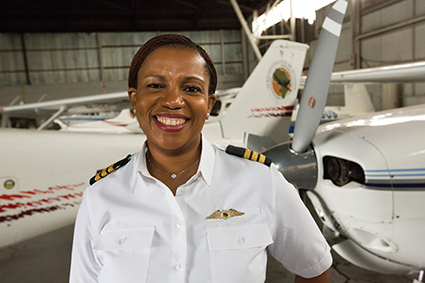 Eventually she managed to get into SA Express and, after undertaking mainly local flights, she joined SAA and became the first African woman to acquire an airline transport pilot licence in South Africa. But even then “it was not easy to get in; it’s a constant fight”. In between, she flew for a private company into war-torn African countries such as Burundi, Chad and Sudan. This mainly entailed transporting workers from aid organisations such as the World Food Programme and Red Cross. Today, Mahapa usually pilots an Airbus 320 or 319 for SAA, as senior first officer (Africa), flying to destinations such as the Dar es Salaam, Libreville and Nairobi. She also serves as an in-flight relief pilot on the Airbus 340 on overseas flights. “I get paid to see the world,” she quips. “It’s one of the perks of the job.” She founded the African College of Aviation in 2012, eager to nurture future generations of aviators. Currently, about six budding female pilots (as well as a number of men) are working towards obtaining their commercial licences, and another seven are finishing their PPL. Some of the trainees’ studies are funded by the government, while others are enrolled in their private capacity. “Especially black women are still going through what I went through in 1999,” she observes. “I’ve seen people spending a lot of money and giving up along the way because there was no one there, holding their hand. “There is a desperate need to train up pilots, particularly from previously disadvantaged backgrounds,” says Mahapa. The reality is that a shortage of pilots worldwide is looming. Even up until recently, Mahapa has had an uphill battle to be recognised for what she does. She has never expected respect on the basis of her status as the country’s first black woman pilot, preferring to be judged on her merits and performance. But she has had to put up with suspicion, sexism and discrimination in her slow path up the ladder. “The ‘old guard’ initially resented it when they were forced to fly with black pilots, and having a female pilot in the cockpit was even worse for them,” she relates. She reflects: “When I look back at young Asnath, I was more assertive and fought for what I believed in. As you mature, you start calculating your moves more and compromising. HOW CAN YOU BECOME A COMMERCIAL PILOT? You need a good matric pass, with maths and science. Enrol at a good flying school that is accredited with the South African Civil Aviation Authority. First train to get your private pilot licence (PPL) – you will need a minimum of 45 hours of flying time on your own and with instructors (entitles you to fly a plane privately and carry non-paying passengers). and carry paying passengers for a commercial airline). To get into a small airline, you’ll need to log at least 1000 hours. You will need to pass a medical test. To apply for a bursary to a flight academy, contact the Transport Education and Training Authority (TETA) by visiting www.teta.org.za. The African College of Aviation, located at Rand Airport in Germiston, east of Johannesburg, is South Africa’s first 100% African-owned flight school. Multi-engine type rating (to fly a multi-engine aircraft).